Gold Medal Employees | don't bite the apple…work is not a fairy tale! ← Valentine’s Day and Sexual Harassment in your Kingdom! I have been Olympics-obsessed since the opening ceremonies. I’ve been captivated by everything from the parade of athletes to the “Making of an Olympian” NBC special in which they followed athletes’ journeys through their parents’ eyes. 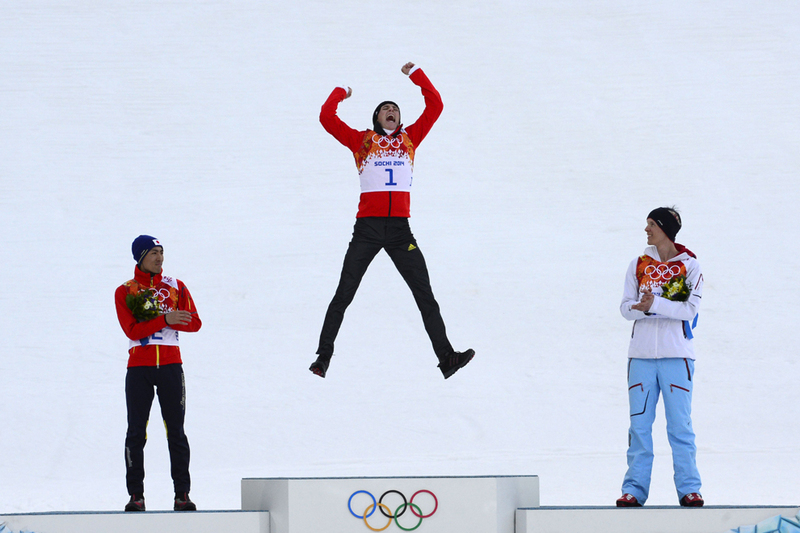 Watching the Olympics, you see different types of athletes- those who are determined to stand on the podium and those just happy to be there. The Human Resource brain in me started thinking about Gold, Silver and Bronze employees. Can you make someone a medalist if they are just happy to participate? So far, the most exciting competition I’ve seen is the Men’s Skiathlon 15km. I am in awe of the work that cross-country skiing takes. They use all major muscle groups and have little chance for coasting or use of gravity. The finish line is always exciting, but the three feet after the finish line was what really shocked me. 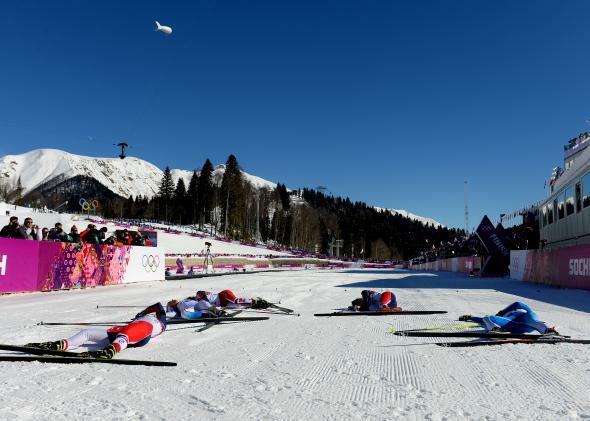 As each skier finished, they collapsed. Not just one of them- all of them. There was a massive line of people lying on the ground, gasping for air and trying to gather enough energy to walk off the course. These athletes gave so much that they didn’t have enough left over to move one more step. I thought about the last time I worked that hard. My mind wandered back to a meeting I had recently discussing how one employee worked tirelessly until the deadline was met. At the same time, another employee was going to miss a deadline, but instead of trying to do whatever she could to meet it, she went to lunch. When I met with this employee, I asked her why she would leave knowing her work wouldn’t get done on time. She responded “Well, I was hungry.” While one employee instinctively wouldn’t consider missing a deadline, I wondered how to get the other employee to understand why she should have skipped (or delayed) lunch. The average workplace has about 10% high-level employees, 10% underperforming employees and 80% average employees. As employers, we all want top-tier employees, but trying to find these high-performing individuals is a challenge. We could keep searching for that Gold Medal employee or we can look to the 80% in our workforce and see if we can get them to the podium. We are all motivated by something different. If you give employees individual attention, you may discover what their motivation is and build a plan to help them grow. We tend to think that money is the great motivator; however, that isn’t first on the list when employees are asked what is most important (it’s 3rd). The number one thing that employees look for are opportunities to use their skills and abilities. If they are creative, give them input on exciting projects. If they are analytical, bring them in on a forecasting project. The second most important motivator is job security. If an employee knows you are invested in and are planning for their future, they will want to put in the extra work. Fourth and fifth on the list were communication with management and relationship with immediate supervisor, respectively. Employees want to feel part of a team, not told what to do because you said so. Make sure you are being a leader and not just a boss. So during this Olympic period as you are uplifted by the greatness, look at your team. Who do see who is close to the podium and figure out what you can do to get them there. Ask the rest of your team where they want to be and what you can do to help them accomplish their goals. You may be surprised by the answers and how many will collapse at the finish line for you! See you at closing ceremonies! Looking for Olympic updates check out NBC Coverage! This entry was posted in Employees and tagged employees, Employment, Gold Medal, human resources, leadership, motivation, Olympics, Sochi, training. Bookmark the permalink.